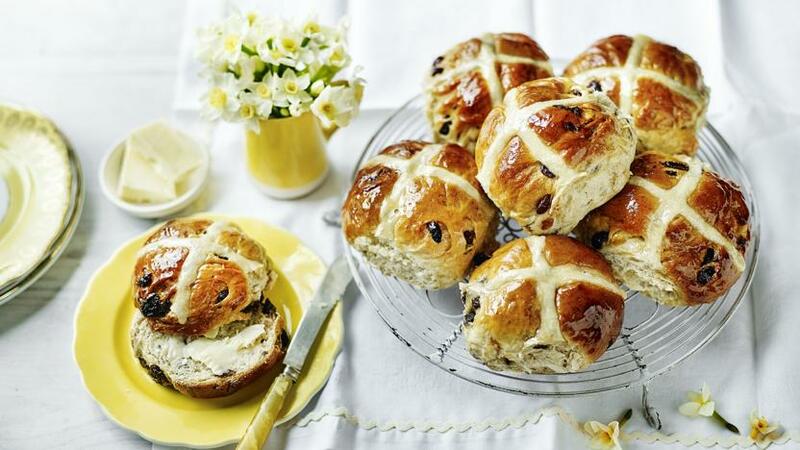 Mary's going to be so proud that you made your own hot cross buns this Easter. Lucky thing her recipe is completely foolproof. For this recipe you will need a piping bag fitted witha fine 3mm nozzle, but if you don't have a nozzle you could use a piping bag and snip the end off. Melt the butter in a pan and warm the milk in a separate pan. Add the butter and half the tepid milk to the dry ingredients. Add the egg and use your hands to bring the mixture together, incorporating the flour from the edges of the bowl as you go. Gradually add the remaining milk, to form a soft pliable dough (you may not need all of the milk). Slip each baking tray into a large clean polythene bag, making sure the bag doesn’t touch the buns. Leave for 40-60 minutes until the buns have doubled in size. For the topping, add the flour to a bowl with 100ml/3½fl oz water. Mix together to make a paste and spoon into the icing bag. When the buns have risen remove the polythene bags and pipe a cross on each bun. Bake for 15-20 minutes until pale golden-brown, turning the baking trays round halfway through if necessary. Melt the golden syrup in a pan and while the buns are still warm, brush the buns with a little syrup to give a nice shine, before setting aside to cool on a wire rack. This buns will keep in the freezer for up to 1 month.